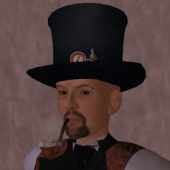 Gentleman-sorceror, resident of Caledon, and purveyor of Victorian and steampunk-themed curios and gadgets, albeit not very many of them at the moment. They can be found in the Arcane Designs store just outside my mansion in Caledon Moors (if you teleport there you will land at the hub — walk north-west to find the mansion). Say hello if you meet me. Elsewhere on the net I am known as Pyter Voeros, and I am into world-building, con-langs, and other geeky stuff. Find me at the eye of the storm, my home web-site. I picked up your blog via the ‘blogging’ tag on theWordpress homepage. We want to link 1001 bloggers. It’s early days but currently there are 22 down, and 979 to go, so it would be great of you felt able to take part. Feel free to email me with any thoughts on the scheme.